Scott is the lead singer and founder member of: SUPREME QUEEN (A DAZZLING TRIBUTE). After attending Sneyd Comprehensive School in Walsall. Scott knew that there was only one road for him in life, music and singing. He started performing with a group called ‘1BZ’ where he discovered his first taste of live performance. This led to him joining a cover’s band called ‘KID GLUVZ’. The band enjoyed 3 successful years touring up and down the country performing on the club circuit. 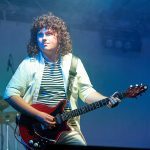 But Scott’s love for ‘QUEEN’ was evolving more rapidly, as also now the bands repertoire included a few songs of Queen which quickly became a mainstay of the bands show. Eventually KIDD GLUVZ disbanded but from this in 1995, came to be what formed as KILLER QUEEN (A Spectacular Tribute). Since forming in the mid 90’s the band have gone through many guise’s. But through this Scott’s dedication and perseverance and love for Queen’s music as led him to develop his craft, which he has continued doing so with his band for 20 yrs. Scott has experienced many highlights in his career from the beginning’s of “serving his apprenticeship” as he says first of all in many years on the club circuit. To performing in Arena’s, Festivals and Theatre’s in the UK, Europe and Asia. Also to meeting Peter Freestone(Freddie Mercury’s Friend and PA). When Scott is asked who is his favorite Musician he has only one reply ‘Freddie Mercury’. Loves: A Cup Of Tea, Chinese & Indian Food. Hates: Sliced Bread & DC-10’s. Music likes: All Queen albums.